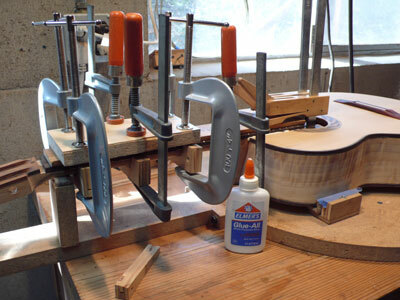 To assemble the guitar the completed Rim is installed in the Universal Mold face down. The Back is then glued on. When the glue has cured the open body is then taken out and re-installed with the Back down. A thin coat of shellac is applied inside to the Sides, the Back and the (yet) unattached Top as a moisture barrier. Then the Top is glued on. Next the bindings are installed and the body sanded smooth. Then the Neck is carefully fitted to the Body and glued on. Then the Fingerboard is made, fretted and glued on. The final assembly step is the gluing of the Bridge. All these steps require great precision. 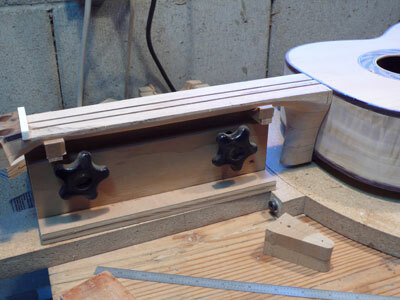 The vertical posts of the Universal Mold are not only used to define the outline of the guitar, they are also used to clamp the Back or the Top to the Rim for gluing. Each posts has a screw-in threaded rod and a larger diameter cork-padded disk that is pressed down with a wing nut during the gluing process. 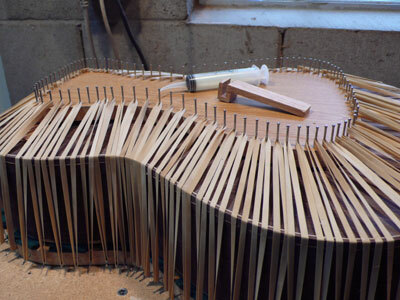 Prior to gluing the Back it is precisely positioned over the Rim, and the positions of the bracings are marked on the kerfing. The kerfings are then slotted to accommodate the ends of the bracings, and the bracings are cut off to fit into these slots. This will greatly strengthen the body. 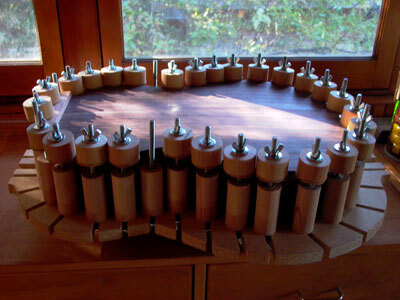 The process for gluing on the Top is the same as for the back. 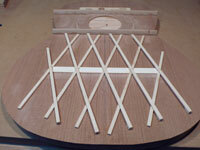 The Top is first aligned on the Rim to mark where the cross-braces fit into the kerfing. Then the kerfings are slotted as shown above, and then the Top is glued and clamped in the same way as the Back was before. 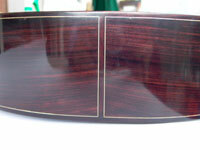 The lining is a strip of hardwood installed along the edges between the Rim and the Top and the Rim and Back. Often this is made from the same wood as the Sides, but it can also be different for color accent. 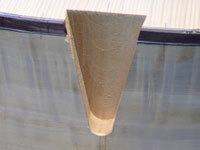 In general the lining includes several veneer strips of different color to give the lining a distinctive look. This is called purfling. To prepare for the lining and purfling a rabbet is cut into the Rim along the edges of the Top and the Back as shown. 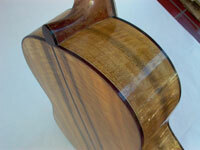 The joints of the lining and purfling strips at the back inlay are tricky and need to be done with great care. 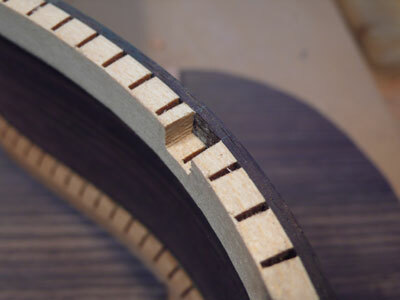 Before the linings are glued in they need to be shaped to the curvature of the Rim. I do this in the bending machine, same as for the Sides. 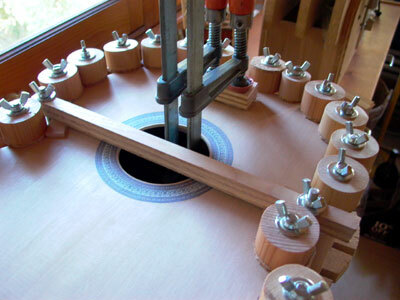 To obtain a tight fit the linings are pressed into the rabbet during gluing. 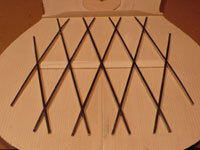 This is accomplished using a fixture consisting of two parts, one on the top and one on the bottom of the Body studded with nails and a large number of rubber bands between them as shown. 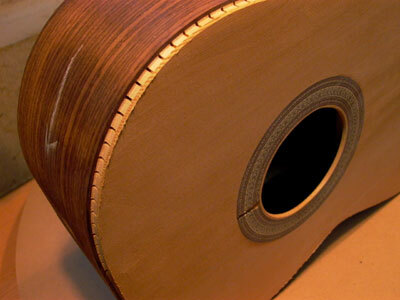 The Neck needs to be precisely joined to the Body. Key points in the geometry are the Nut, the Saddle and the 12th fret. 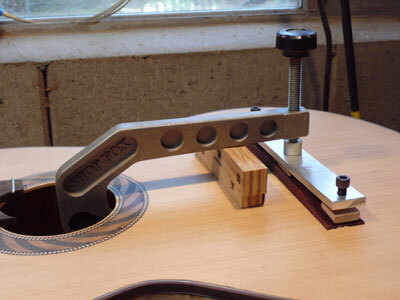 Not only do they need to be on the centerline of the guitar, but the triangle these points form must allow for the correct string action height. Contrary to the Steel String Guitar the Neck of the Classical Guitar does not contain a so-called truss rod which allows height adjustments of the neck. Once the correct position of the neck has been established the Neck/Body fit of the heel needs to be carefully achieved with chisels and sandpaper. For the Neck/Body joint I use a double dovetail wedge which fits corresponding cutouts on the Body and the Neck as shown below. 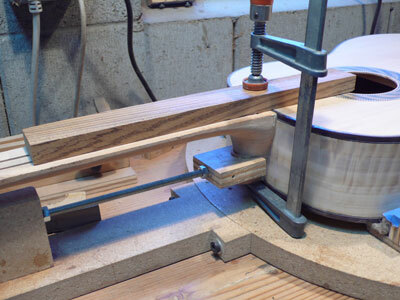 The gluing and clamping is rather simple. 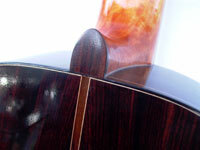 Note the double carbon fiber strip in the center of the Neck which stiffens the Neck to reduce Neck bending as a result of the string tension. 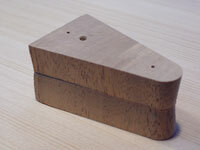 There are many ways to to make the Fingerboard and to glue it to the Neck/Body. My preferred way is to fit the unfretted Fingerboard to the Neck/Body, then to cut the fret slots, then to install and dress the frets and then to glue on the Fingerboard. Others glue on the slotted and fitted Fingerboard before fretting it in place. 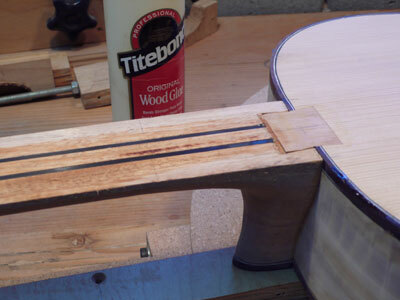 I have also glued the finished fretted Fingerboard to the Neck before gluing the Neck to the Body. Each approach has its pros and cons, and I will continue to experiment until I settle on the best approach. 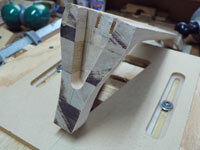 The Bridge can be glued on either before or after the Top has a finish on it. What is more important is its precise position relative to the 12th fret, the center point of the string length. 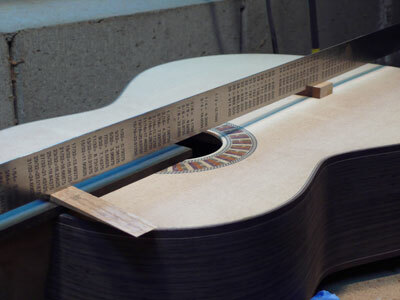 The distance between the front edge of the Saddle and the center of the 12th fret is the same as the distance between the Nut and center of the 12th fret with a 2.5mm compensation added at the Saddle. Note that the bottom of the Bridge has a curvature to match the Top's . Also, for the gluing process a caul is used on the inside to allow the Bridge to be clamped against.